Well we're glad to be back well at least most of us. Personally I am. But, we are still rounding up the staff so this week there is a shortage of articles so instead of five or six articles you will only see four. We will definitely be back up to full speed next issue where you can expect the old quality hard work that the JBC brings you every two weeks. So until then enjoy issue 24. And Happy New Year. Terrible news had reached the ears of Peach Creek three days ago as Plank was reported missing. The Culde-sac was shocked to hear that Plank couldn't be found two days ago. Jonny who is terrified declined an interview from the JBC as he was too busy looking for his best friend. Four days have passed since the disapperance of Jonny's best friend. The kids of the Culde-sac have formed a search party since the police department doesn't look for so called "inanimate objects." So far there are no leads or clues to be found. The first kids to be questioned were the Eds since Eddy had recently lost an election to Plank in November. Yet the Eds hadn't been home for six days. There are many theories of what happened four days ago. Most state that he was kidnapped but I like my theory the best which is Plank was captured by aliens in attempt to teach them how to grow trees on their planet. But still that is just a theory. There are so many questions to be asked such as why Plank? Who did it? And why is the sky blue? Still the kids continue their search for the hunk of wood they care so much about. The JBC Escape Part... I don't know! "I don’t know how to fly the ship," I blurted out. I gazed around at the horrified looks on Justin and Winston’s faces. "It’s really a funny story," I began, "You see the only reason I knew how to launch the ship was because of the button there on the console. As you can see, it plainly reads ‘Press to launch ship.’ And the reason I knew how to fly the ship thus far, when I was actually at the console, was from spending thousands of dollars playing Space Invaders." "What’s Space Invaders?" Justin asked. "I don’t know. Anyway the point is that we are all going to die unless someone knows how to dock with the space station." "No Winston, hitting the wall does not count as docking." He promptly lowered his hand. "So I guess no one has any ideas?" I asked looking around at my "friends" for the last time. "Well…," Justin started, a rare look of inspiration crossing his face. "We could all pile into the escape pod at the back of the space ship." I stared at Justin in awe, Winston was flabbergasted as well. Justin had an idea. One that had a practical application for once as well and not something that floated around doing nothing like a certain something we were about to crash into. "Everyone to the escape pod," I shouted for no reason in particular. We all rushed back to the back of the ship and were confronted with an interesting situation. "Which door is the hatch to the escape pod?" I asked, looking at the two identical doors now facing us. "I think it’s this one," Justin answered, pointing to the door on the right. "Or maybe it was this one. Maybe I should have paid the extra nickel to have them labeled. Oh well, that’s one more nickel for me." "Fine," I said, "We’ll go through the one on the left." "And your reasoning sir?" Winston inquired. "It’s the one Justin didn’t pick." With that we quickly scrambled into the darkened chamber, strapped in, stop to take a drink from the drinking fountain, and then prepared to jettison ourselves. I quickly perused the console in front of me, and being milliseconds away from impact with the space station, I promptly jammed the big, red button done. It was only then that I saw something written at the bottom of the console. I had just assumed it said escape pod, so I hadn’t bothered to read it. Now that I had a free second while the pod disengaged I looked at the writing. Written in big, bold, red letters were the words "Experimental Time Machine". I was just about to tell the others about my discovery when I blacked out. What will happen next? Was this story written in the past and only published now? Is this a cheap marketing ploy? You betcha! Stick around for the exciting, quasi conclusion in the next issue of the JBC! Will this story ever end or is Dr. Eric too lazy to think of another idea? Welcome to round two in the Cul-de-sac Baseball League's (CBL; Long story short Eddy got a days wortha Jawbreakers out of Justin's pocket and Justin's got that money hording look in his eye again) playoff's, championships, and season; all in one. Well, this time it's the Eds as the hometeam, so you'll see if this ends any different then last game. 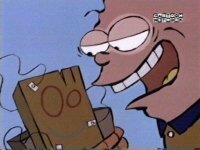 Of course this is just gonna be a recap, and since we only had Plank in the audience it shouldn't really matter to any of you. In the first half of the inning, Kevin made it to third, Nazz was walked, Sarah and Jimmy were struck out and that was it. 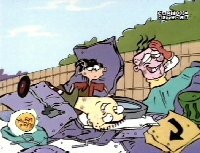 Still at zero, I began to get bored and made a drawing of Rolf, Eddy, Kevin, and Ed hitting each other with bats, except Ed was hitting himself in the picture. Johnny went up to bat and struck out thanks to some commentary by Plank over Kevin's outrageous slander over Plank's mother. As Edd went up, Sarah forced Kevin off the mound, and got up herself; because of her crush, she walked him, thereby ending Sarah's turn pitching. Once Ed's turn came around he would've been struck out if it wasn't for Rolf's keen eye to Kevin hitting him with the ball. With two people on base, it was all up to Eddy; he hit one off, it bounced off Jimmy, and was caught by Nazz, ending the inning. I missed the second inning, but apparently Kevin's team scored one, and Eddy's had scored 3 thanks to an angry Ed's hitting. Anyway, in the third inning Ed now more scared then angry over a little talk Sarah had with him after her team didn't score at all(although I don't consider something that nearly bursts your eardrums to be that little); needless to say it looked grim for the Eds, but Johnny's little messing around actually got the ball beyond reach, well, they could get it, but they decided not to seeing as it was on the Kankers side of the creek. After a short break and a near-death experience for me upon retrieving the ball, the game restarted. An enraged Kevin actually struck them out twice bringing an end to the game. 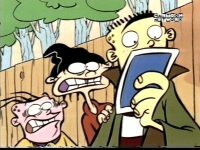 Well, I don't know who didn't see it coming that Eddy's team would win this one bringing it to a tie between which team will get to keep, or recieve those Jawbreakers and Eddy's records. Be sure to read the next issue of the JBC to find out! With the success of the Culde-sac Baseball League or the CBL as they're also known as. The league now has their own baseball card line expected to appear next week. The cards will feature all of the Culde-sac kids in more than two hundred and fifty cards. The packs are expected to be a very good success with over one hundred people demanding them. I am also proud to announce that I'm the new Commisioner for the CBL. And well I have decided to take in ten percent of the profit that comes from the cards. This will um.... go toward more issues to the site. Personally I hope these sell well. New CBL Cards Sold Here! get them before they're all gone!